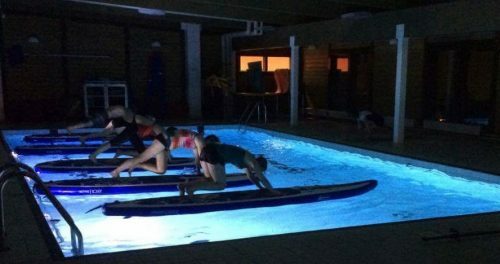 Take your training to the next level this year and improve your balance, mobility, indurance as well as physical and mental strength on a SUP board in a cosy 33 degrees warm pool! Give yourself time for total relaxation and energy boost when autumn arrives with it's cold and dark weather. You will practice SUP yoga or fitness in a small group (maximum 7) led by a certified and dedicated instructor. Courses start in september-october 2019. Place: Solvändans simförening - Futurum Sim & Sport, Ljungadalsgatan 2 E, Växjö. Book via e-mail and pay via SWISH 1236582951 before 9th of September, if you want to secure your place. TRY SUP yoga and fitness day! When: on 24 august, 10.00-12.00 at Solvändans simförening, Futurum sim & Sport. Book via anna@supergym.nu and pay via SWISH latest 22 d of August, to ensure your place.